If you take your softball or baseball seriously, you need to protect your equipment. One of the quickest ways to wear out softball and baseball bats, gloves and other items is to take poor care of them. The dugout is often the place where equipment is neglected. By leaving gloves or bats lying around, you allow them to be stepped on, tripped over or kicked around by teammates. There is nothing worse than paying $100, $200 or more on gloves just to have them wear out due to poor care in the dugout. The DOM Transformer , can take care of your softball and baseball equipment. The DOM Transformer is an amazing item that keeps a player’s bats, glove, batting gloves, water bottle and more from being on a dugout floor or cast aside on the bench. DOM Transformer – How does it work? The DOM Transformer simply hangs from a chain link fence and holds a number of important pieces of softball and baseball equipment. The DOM Transformer takes up minimal space, and it creates even more room for players, coaches and staff to have in the dugout. What does it hold? The DOM Transformer easily holds two bats, a glove, batting gloves, a drink bottle, towel, sunglass and more. The DOM transformer is small and lightweight. It can fit into a player’s travel bag or coaches can use them for the entire team. Once the DOM Transformer has been attached to the fence, a player or team’s equipment can easily be placed on it. DOM Transformer – Why do you need it? Any softball or baseball player that takes the sport seriously needs a DOM Transformer. Traveling teams can use the DOM Transformer as a way to quickly organize their equipment. There is nothing worse than traveling city to city playing softball or baseball and struggling to find equipment once you are in the dugout. The DOM Transformer allows two bats to be hung from it. This means that an entire team can hang their bats by using two or three DOM Transformers. Each DOM has three hooks that can easily hold players’ gloves, batting gloves, towels and more. In addition, there is a water bottle holder. The simplicity of the DOM Transformer means the clutter of a dugout is a thing of the past. It also means players will have little difficulty in getting the softball and baseball gear they need when they need it. There is no wasted time in the dugout. Bats and gloves will no longer be damaged, and players can remain safe when not on the field. No matter if you play for a big softball or baseball team that travels the country; or a small team that plays locally on the weekends, the DOM Transformer can make life easier. Traveling teams can use the DOM Transformer to hold important, expensive equipment. It also allows players to keep track of their bats, gloves and other items. The two-bat holder keeps the dugout free from possible accidents. Players and coaches can slip or trip on a bat and become injured. The DOM Transformer’s two-bat holder keeps them off the ground and free from damage. Local teams which play a limited number of games can also benefit from the DOM Transformer. 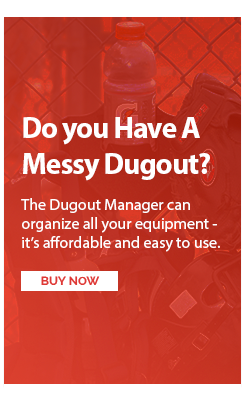 Not only will it safely organize a dugout, but the DOM Transformer may be able to hold an entire team’s equipment. Small teams with a limited number of bats could use the DOM Transformer’s two-bat holder to safely stow away all their gear. The DOM Transformer is a piece of equipment that shouldn’t be left out of the dugout. It keeps a player’s softball and baseball equipment tidy, clean and in full working order. It also keeps a dugout safe and clean. Any day that ends in ‘y’ is a perfect day to play softball or baseball when the DOM Transformer is in the dugout.